At times disturbing and bleak, others raunchy and comical, Adam Pepper’s work is known for a unique blend of horror and science fiction. His latest work, WAITING FOR OCTOBER, a four-author collection of short stories also featuring Sarah Pinborough, Jeffrey Thomas and Jeff Strand is available now. MEMORIA, Adam’s debut novel, immediately attracted a devoted following in genre circles, cracking the Shocklines.com Bestsellers and reaching number one on the Dark Delicacies Best Seller list. His quick-hitting short fiction has appeared in BEST OF HORRORFIND, Vol. 2, SCARS and DECADENCE to name a few. Adam’s non-fiction credits span from NEW WOMAN MAGAZINE to THE JOURNAL NEWS. His poetry was recently published in the 100th issue of the much-loved small press mainstay SPACE AND TIME MAGAZINE. 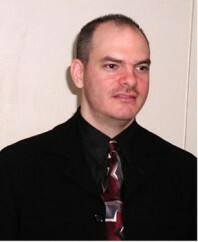 Adam also heads up the New York City Chapter of the HWA (Horror Writers Association). You can find all Gothic.net articles and fiction relating to Adam Pepper at tag Adam Pepper.